Hunter Industrials continually strikes to deliver environmentally sustainable cleaning solutions. This starts with our own processes internally and extends to our customers via the products and service offerings to market. Is there a difference between ‘green cleaning’ and ‘sustainable cleaning’? Yes! Within the commercial cleaning industry, green cleaning tends to refer only to the cleaning products and practises used to deliver cleaning services. 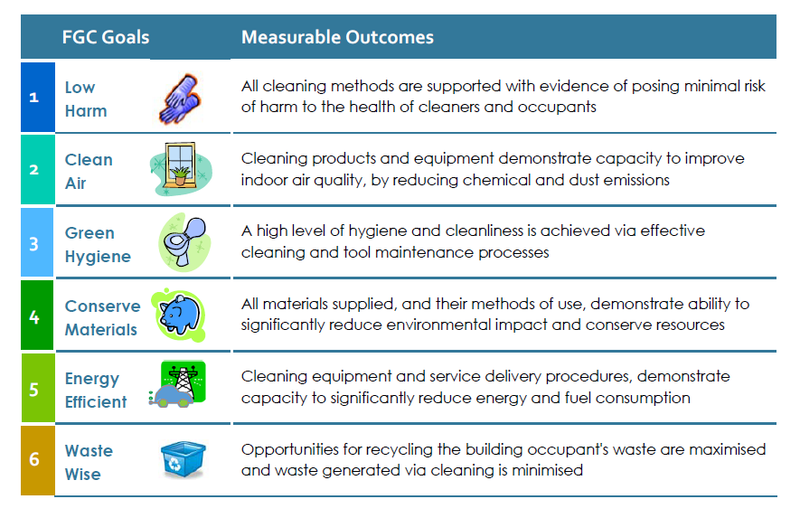 Sustainable cleaning takes a much broader view. It means reviewing all aspects of running a cleaning company and service; and looking for ways to reduce its environmental and social impacts. In our continued efforts to further increase our understanding of benchmark cleaning practices, Hunter Industrials participated in a training program conducted by Fresh Green Clean Director, Bridget Gardner. A large range of product solutions is available, including our green product solutions as part of our huntergreen range. Chemical training is delivered with clear instructions on product use and application. We supply sanitising products that contain twin-chain quaternary ammonium compounds which have stronger antimicrobial ability and lower toxicity than predecessors. We implement improved work processes and/or engineering controls to reduce risk. We provide a clear explanation of the most effective dilution rates on chemical products as well as supporting material (eg. charts, risk assessments, hazardous substances registers). For all GECA* endorsed products, the total amount of Volatile Organic Compounds (VOCs) contained in the product does not exceed 2.5% by weight as used. Our range includes a large selection of non-chemical solutions to maximise clean air quality (eg. microfibre, products, dust control mops). We sell reusable microfibre/cleaning cloths/mops to ensure our customers can clean effectively with minimum waste. We supply chemical products and accessories as well as produce training aids that support the colour coding system to prevent cross-contamination across areas. We supply green certified soaps and sanitisers using readily biodegradable formulations, made with naturally renewable plant-based ingredients. We are aligned with global brand TORK who deliver their ‘Healthy little hands’ program which aims to improve hand hygiene in childcare with appropriate products and teaching aids. For all GECA* approved products, at least 20% of palm oil and palm oil derivatives are sourced from RSPO* certified plantations. Our recyclable PET refill bottles use 30% less material than traditional HDPE. Our TORK Paper products have received FSC* certification for responsible forest management for each step of paper production process (forestry, harvesting and pulping to paper and tissue production). In 2017, TORK is the first tissue brand to publish Environmental Product Declarations (EPDs). An EPD is an independently and registered document that communicates information about the environmental impact of a product from the beginning till the end of a product’s life cycle. We supply the GOJO ADX™ and LTX™ soap and sanitiser dispensing systems which have been engineered to reduce materials and packaging waste. We implement an efficient transport management program that plans deliveries via territory. As at 2017, we have offset 846 tonnes of carbon emissions through offset projects and the establishment of 192 native trees/shrubs in the Yarra biodiversity corridor. We aim to reduce customer deliveries to monthly or bi-monthly orders where possible using effective inventory control management practices. We supply recyclable paper products (including packaging). Our heavy duty garbage bags are produced using 100% recycled plastic. Our supply of degradable bags easily break down when exposed to the natural elements. The use of our chemical dispensing systems and soap/sanitiser dispensing systems ensure an optimal metered dose for effective cleaning whilst helping to control waste.